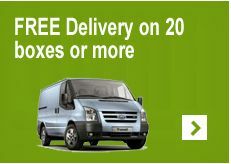 We can deliver to any UK Mainland address, Northern Ireland and Southern Ireland. If you need delivery outside of the blue areas, please contact us for a quote stating how many boxes you require. Orders received before 12pm are normally dispatched the same day. We notify all customers by email once their order has left our warehouse. Goods usually arrive within 2/4 working days after dispatch, generally between 8am-6pm, however the carrier may occasionally arrive outside of these delivery hours. For larger orders the delivery driver may need assistance especially where there are no facilities for unloading. Deliveries are made to ground floor entrance only and the driver may, but is not obliged to carry the tiles into your home or office. Please note any damage to boxes or pallets must be clearly stated on the carrier’s consignment sheet at the time of arrival and reported to us within 48 hours. Please send an email, quoting your order number given on confirmation of purchase.